Having a spell that does the exact same thing as the activated trigger of a major storyline-based card in the same set isn't that creative. But this might actually be more playable since it's not as vulnerable to Abrade and doesn't require crewing. "A new gathering for a new age." Oh Wizards, you cards. 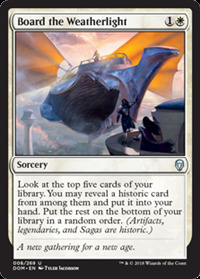 I like this quite a bit in decks that want sagas and have access to Search for Azcanta. Digging 5 deep is real is when you can select cards that contain mass removal effects and combo pieces, planeswalkers, etc. It'd be a lot more tasty at W, but still might hit the spot as a nice new card selection tool in Standard.